So very excited to share our newest offering. We will be offering Aurifil brand threads. Our first color to arrive is Natural White #2021. 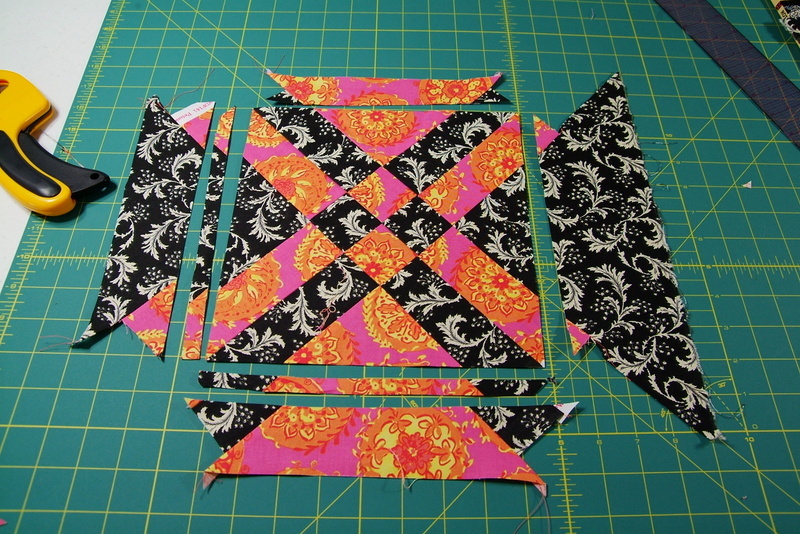 This will be a perfect color for basic piecing and free motion quilting on scrappy quilts! 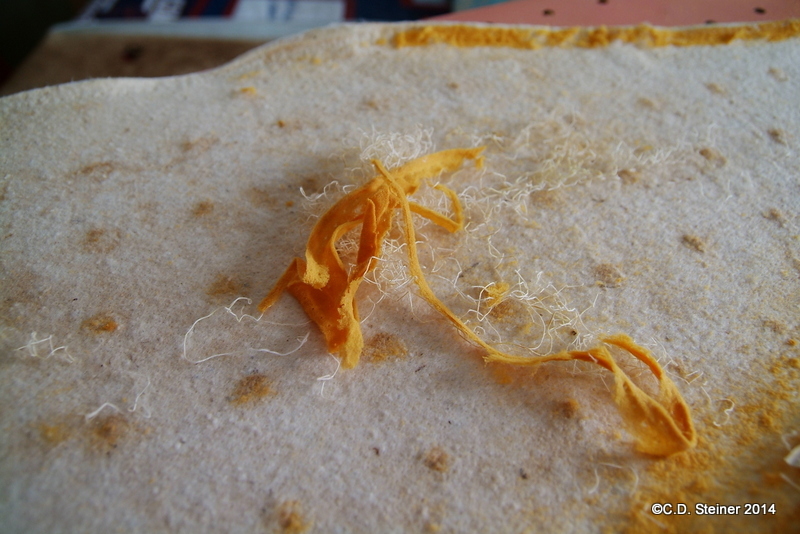 Currently it is in our Etsy shop location but soon will also be here under the notions tab! Hanging Out with Paul and Sheldon! 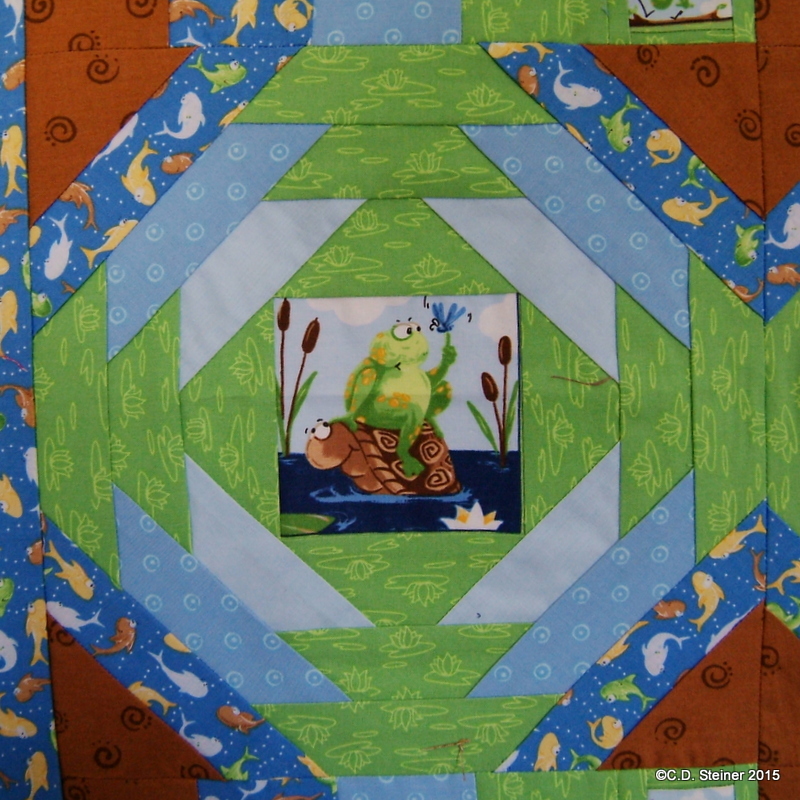 We recently got these amazing fabrics from Susybee in the shop staring Paul the Frog and Sheldon the Turtle! Our entire collection came except the panel (back ordered) so what is a girl to do but come up with a pattern using the many coordinating fabrics in the collection? We put them into our Etsy shop, however feel free to contact us with any requests you might have if you don’t use Etsy! I have to say that the paper method worked out the best. 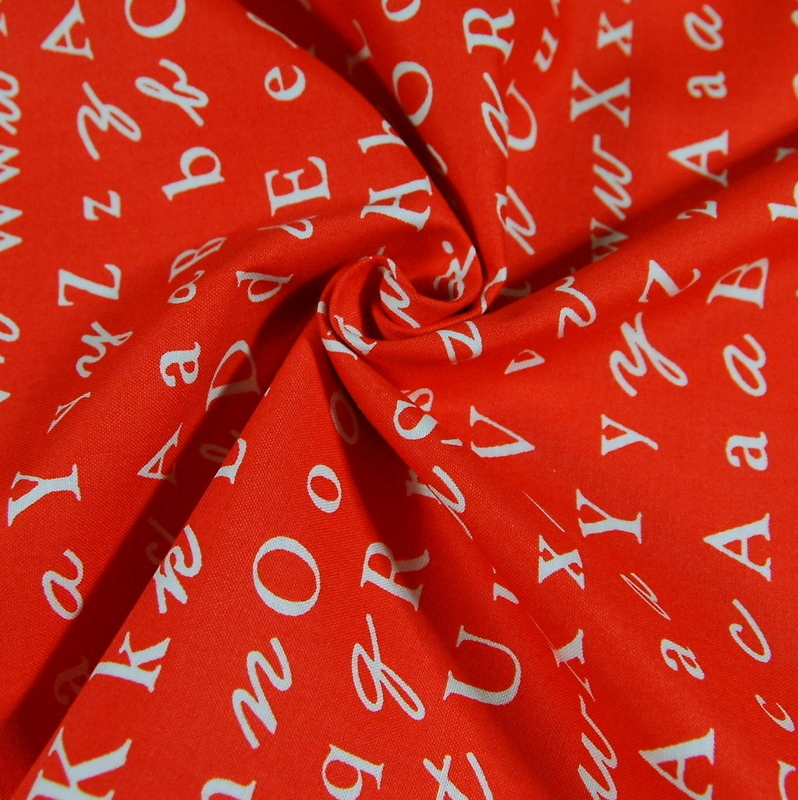 Look for this pattern soon in our shop(s)! 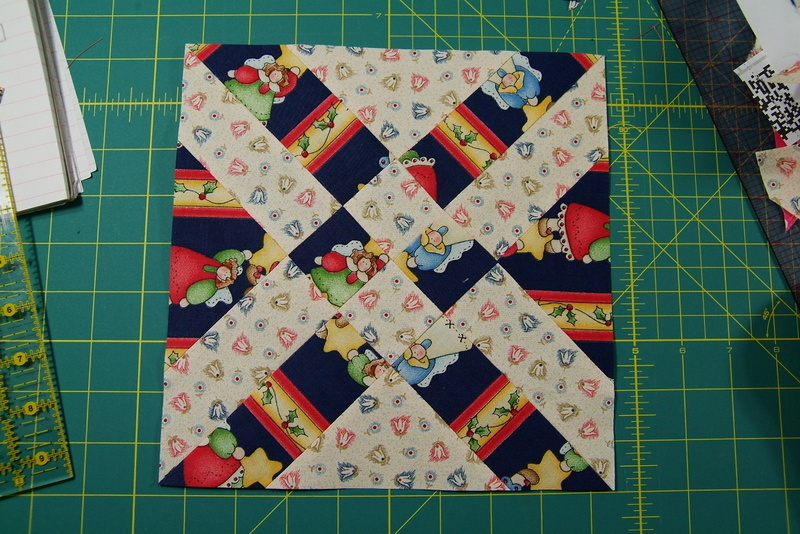 I most likely will be working on the quilting of this over the Holidays! One year ago today we filed our paperwork to become a business! Wow has time flied! To celebrate our special day we are having a very special 1 day only 50% off anything in the shop!!! Coupon code is only good at www.stashtraders.com so please pop into the store and take advantage of this celebration! 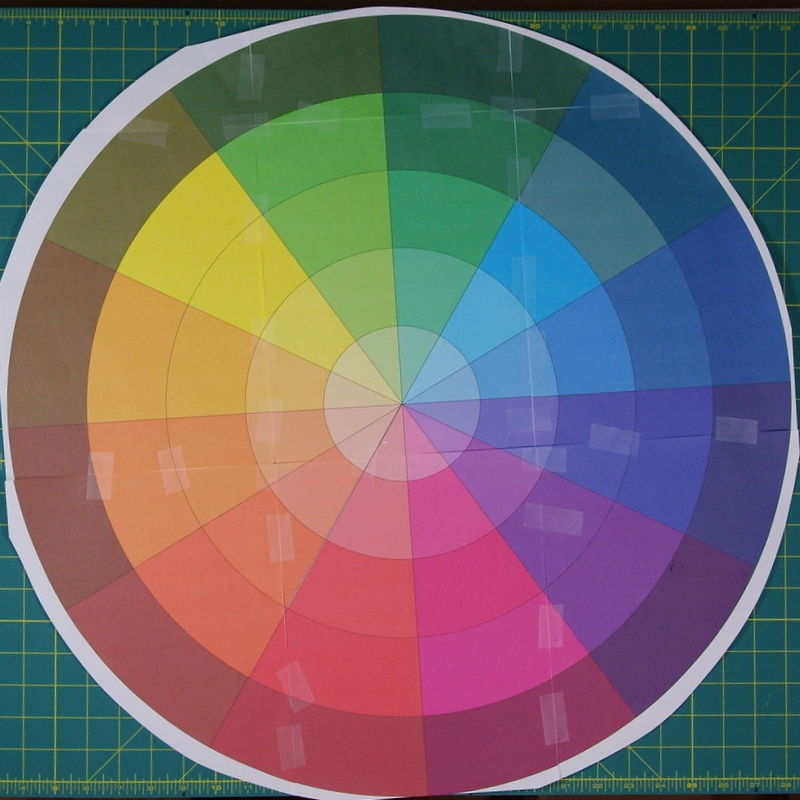 Lessons In Color: Creating a Color Wheel Part 2! How are you coming along on your color wheel? 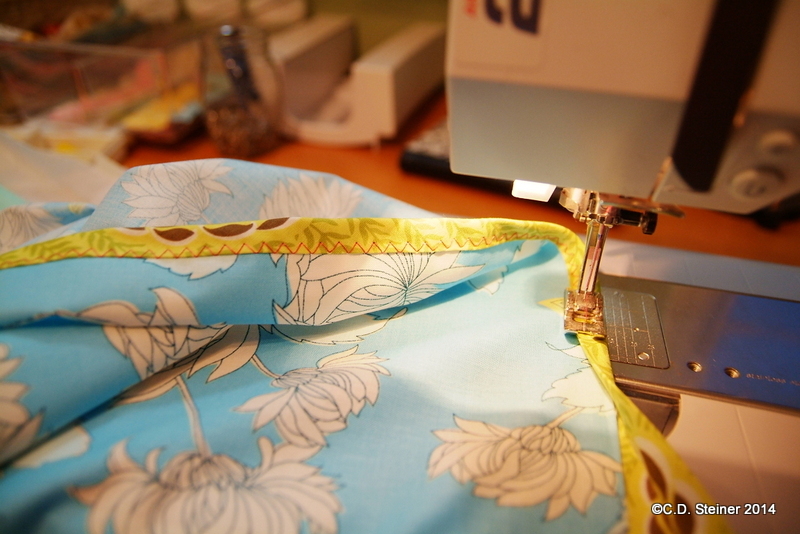 I’ve been working diligently on mine with the fabrics here in the shop. Here’s a peek at mine! As you can see I have lots of colors left to go before this wheel is complete. There’s no rush. This whole process is a process of discovery, remember? Have you thought about those questions I asked of you in the first part of this lesson? Did you come up with some other questions I didn’t include? If not and if so, that’s okay, we’ll re-cap them right here and we’ll give you a chance to chime in with your own thoughts. Don’t be shy, if you have a question, just let us know in the comments section below! 1. Are there lots of missing colors on my wheel? Did you find this exercise interesting to see just how many colors you have? I know I did. I use this to help me fill in the gaps here in the shop and save me tons of time browsing my vendors’ inventory in order to get right to what I actually need. I’m a start-up so time is money to me. The quicker I can do this task the better off I’ll be and hopefully keep me from purchasing inventory that I don’t need. What about you? Were you able to fill out the wheel? If not, don’t worry. I’m not here to tell you you have to fill in every spot on the wheel. It’s not necessary to have every color known to man and is perfectly acceptable to have only what you love. If you love blues (like me) but don’t care for purples then that is okay! 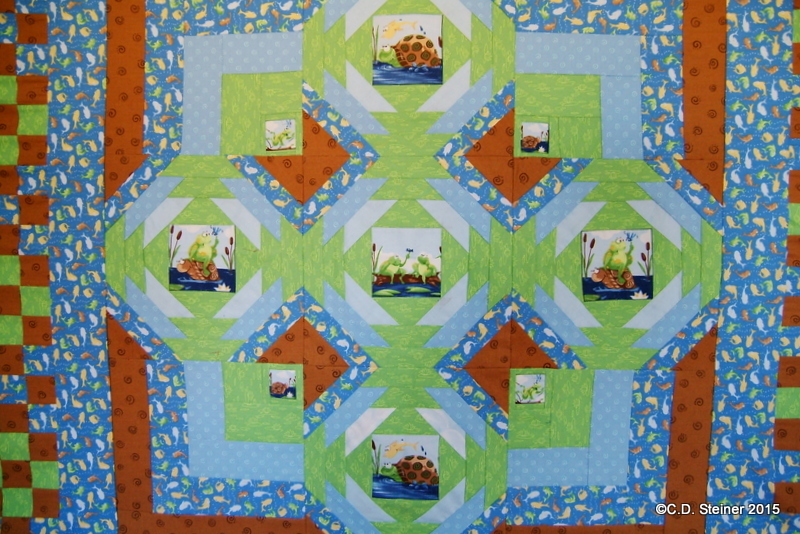 Trust me, the more quilting, crafting or sewing you do, the more that, in time, your collection will expand. I believe this exercise will better prepare you for your own color journey and help you make the right color decisions the next time you shop! 2. Do I have multiples of the same color? 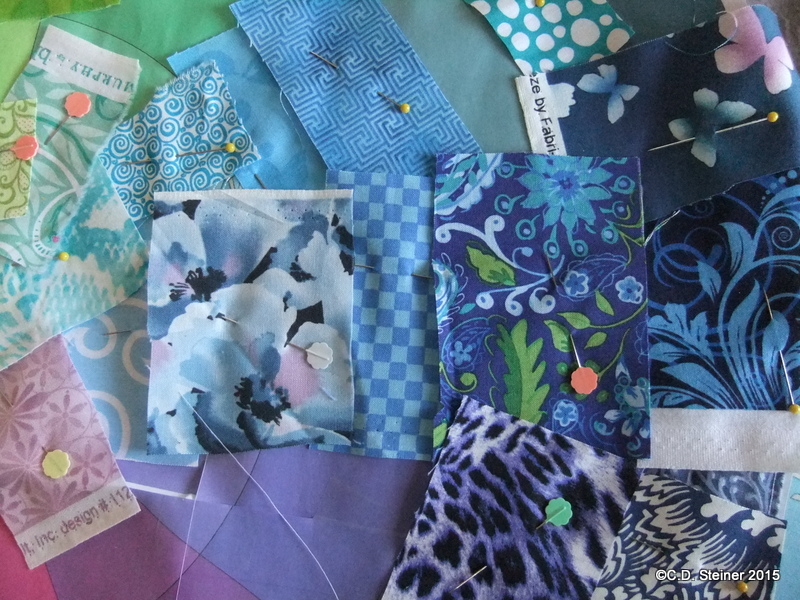 For the quilter, crafter or sewer, you may realize that the reason you have certain colors in your collection is because you naturally gravitate to them! At this time, I want you to take a step back and realize something about yourself. The colors that you have multiples of are the colors you love. It’s that simple. That may or may not be obvious to you but on the other hand were there any surprises for you? Were there colors that piled up that you didn’t think about? 3. Are there any colors you have a hard time finding a place for? So? 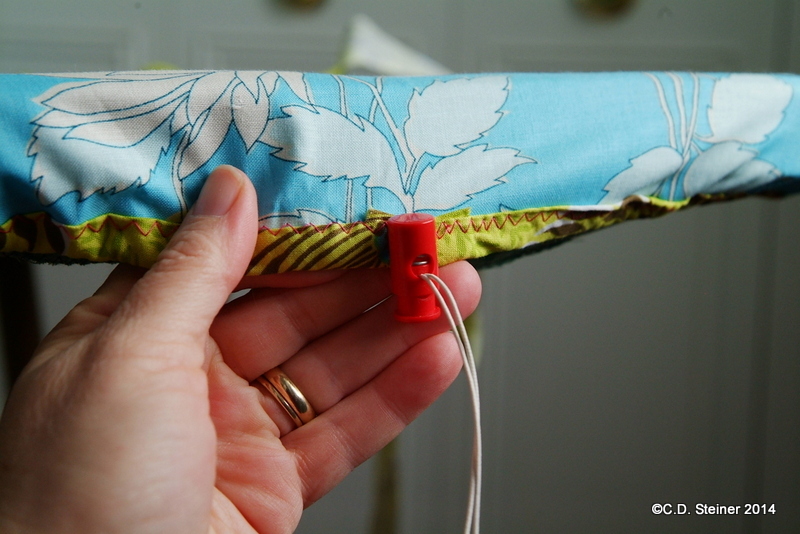 Did you come across fabrics that you didn’t know where to put them? Were they neutrals, flesh tones, browns, tans or blacks? I know I have plenty of those and don’t worry. 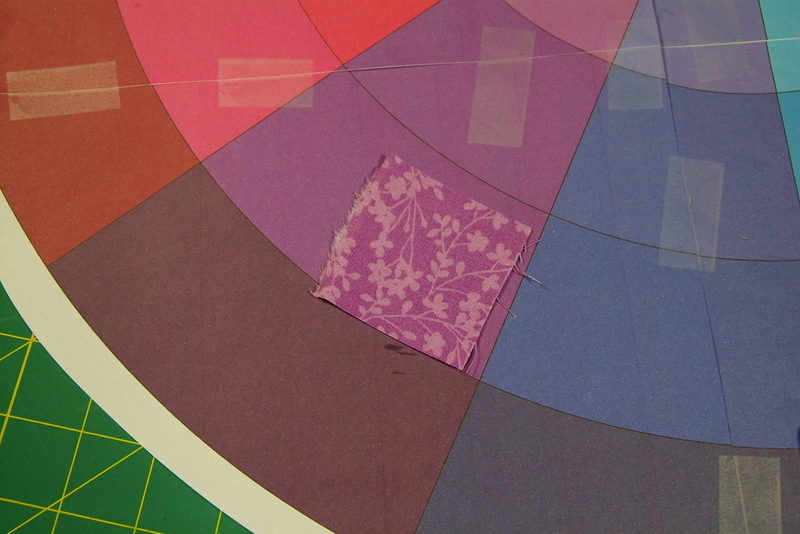 I’d like you to hold on to those as our plans here for this color wheel are to bring in all those neutrals into the background. 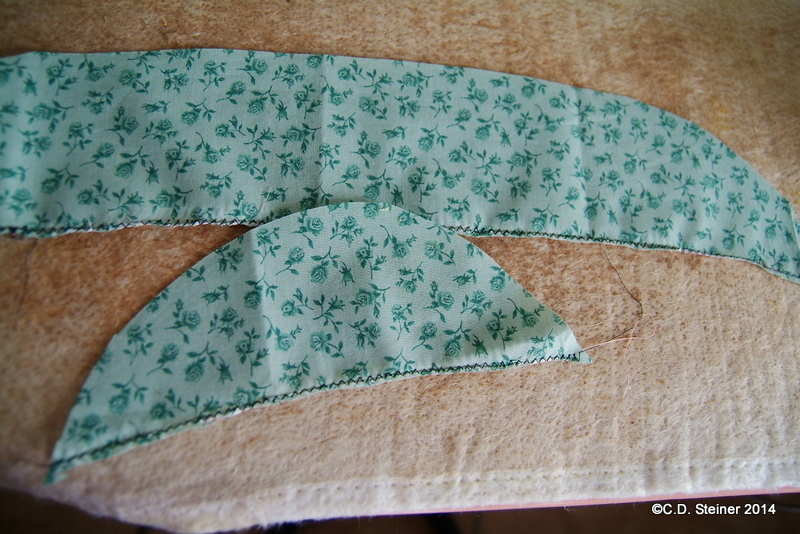 I have the whole section filled in and am ready to trim and sew. This lesson and project isn’t a race but a learning experience. We’ll check in each month on the progress and bring new lessons in color. Color and color theory is fun and one of the most enjoyable aspects (at least to me!) of planning a project! I know many people have trouble and lack confidence when it comes to color so if you haven’t started working on your own color wheel…there’s always time…please jump in! As a fabric shop owner, one of the things I find challenging is making sure my shop is stocked with fabrics in a wide range of colors and options. Like you, I also shop for fabrics (albeit on a grander scale), and more often than not I have to shop for these fabrics without the aid of having the fabric in front of me! If you shop on-line, that sounds familiar doesn’t it? 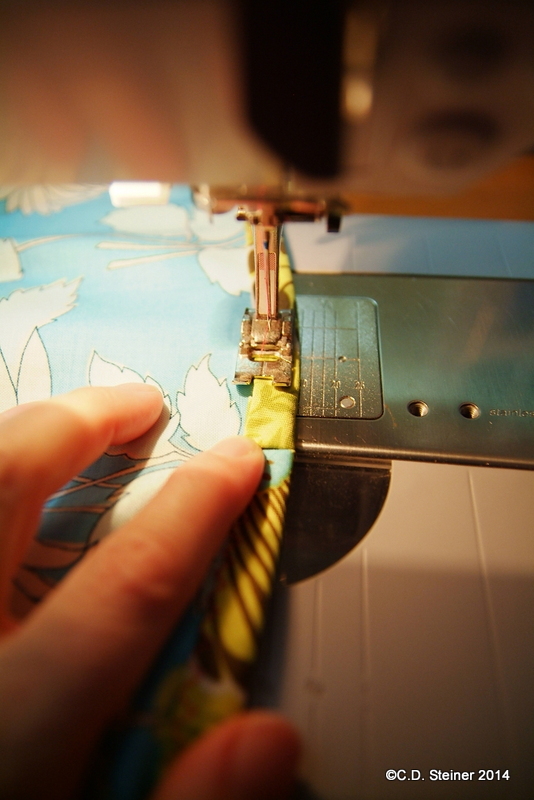 You too are shopping to fill in the gaps of your own fabric collection, or starting from scratch and coordinating for a new project. 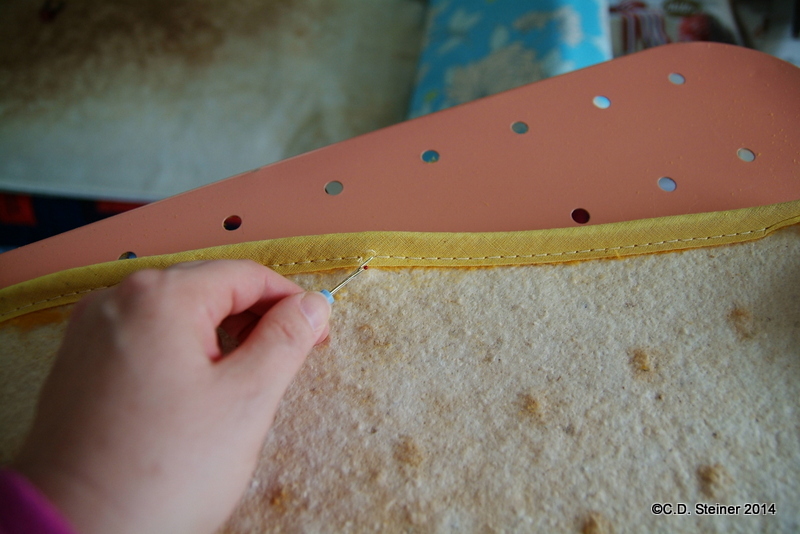 Or maybe you have something that is nearly complete and you need to find that perfect fabric to see it to the end! Wouldn’t it be great if there was a way to communicate in color? Well there is, it’s called the color wheel! Though I must warn you, not all color wheels are the same. 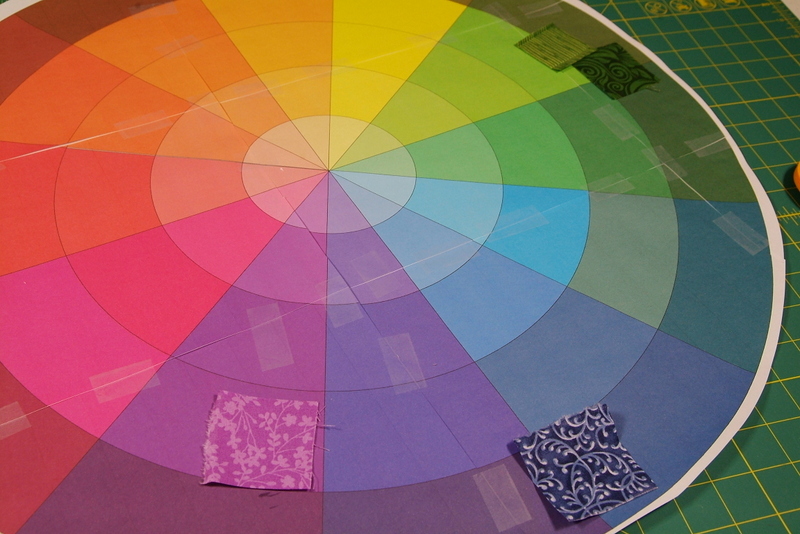 I have found that the best color wheel for quilters (and sewers too) is the 12 slice pie version with gradations from light to dark. 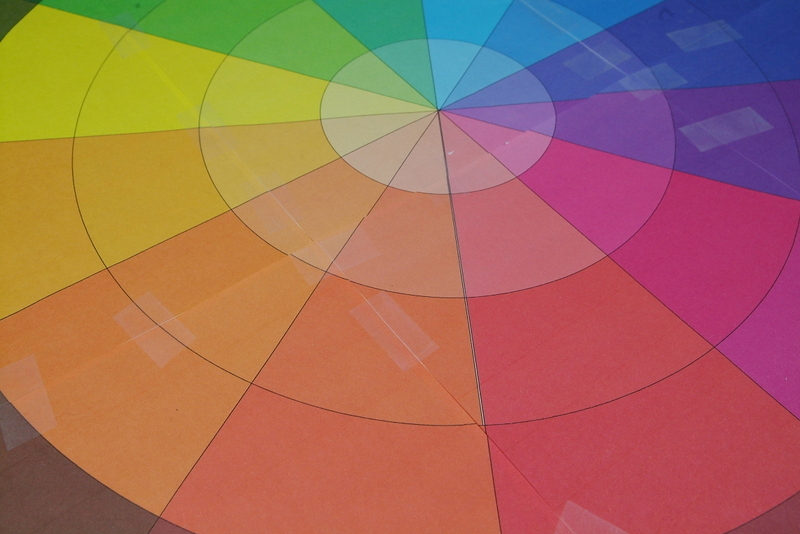 Much like a painter’s color wheel, the Quilter’s Color Wheel has 3 Primary Colors (Red, Yellow, Blue) and 3 Secondary Colors (Orange, Green, Purple) and then the 6 in-between colors, or Tertiary Colors which are a mixture of the Primary and Secondary (Red-Orange, Orange-Yellow, Yellow-Green, Green-Blue, Blue-Purple, Purple-Red). When a painter creates a color wheel they start with a pigment and by combining white to the pigment they will Tint the pigment down to the lightest value they can create. When they add black to the pigment they work the value scale in the opposite direction creating Shades until reaching nearly all black. A painter also has the advantage of mixing complimentary pigments together to produce neutrals. 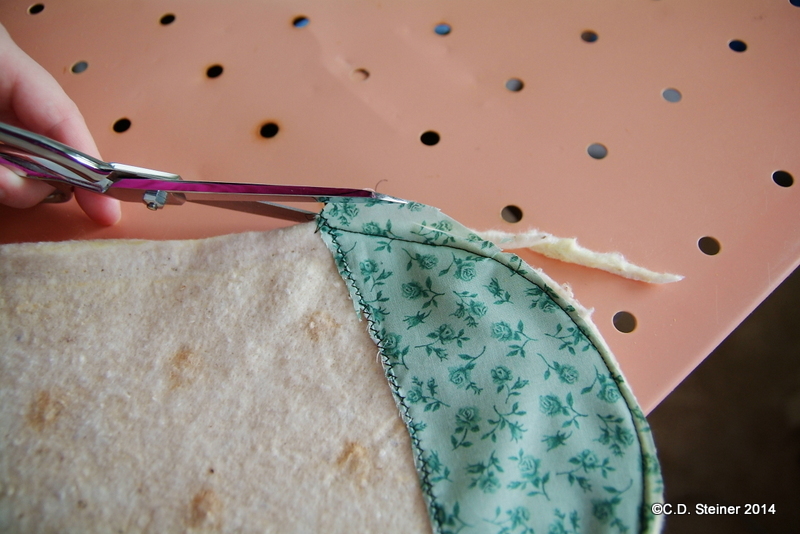 We quilters and sewers however find ourselves in a very different situation. UNLIKE a painter, we can’t just mix a color, rather we have to SHOP! Our fabrics come in a vast array of colors and every single time we make choices, in a shop or within our own fabric stash, we have to decipher the color code. For many a new quilter, sewist or designer, this is where the blood runs from our faces, eyes glaze over and we are left in a haze of aimless wandering. We don’t know where to turn or how to choose a fabric. We test bolt after bolt and sometimes spend hours trying to come up with a mix that works. Sometimes this can be so very frustrating, not to mention extremely time consuming! 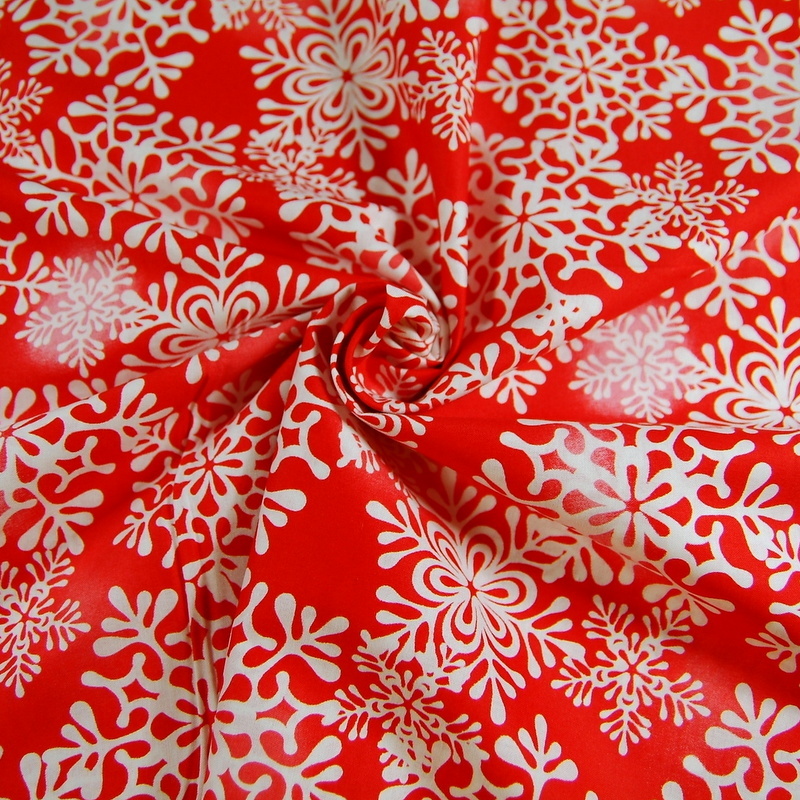 So let’s start at the beginning with our own fabric collection. Let’s first discover what we have. This is where it gets fun and I promise you once you’ve done this exercise you’ll begin to see your own collection in a whole new way! 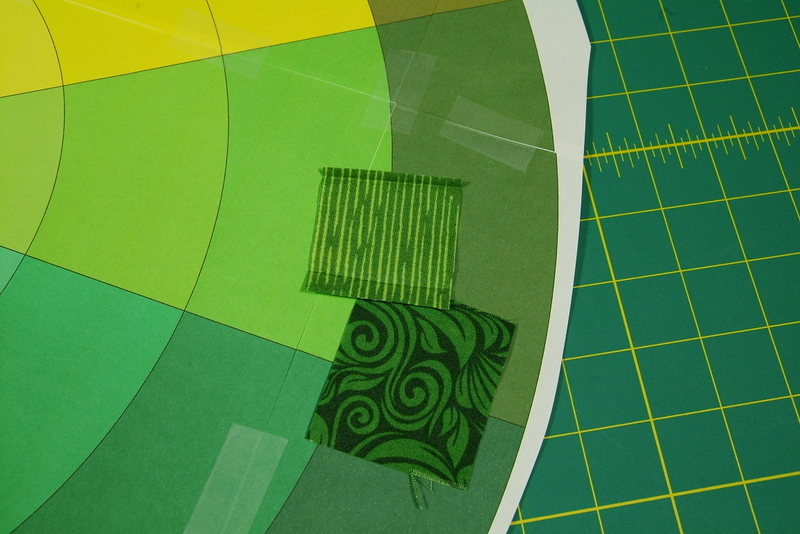 First I want you to print the Quilters Color Wheel . This is a .pdf file that will print on 12 pages. The wheel is in color so be sure to use a color printer and not a black and white (I know, sounds obvious, but that is important). Take your time. 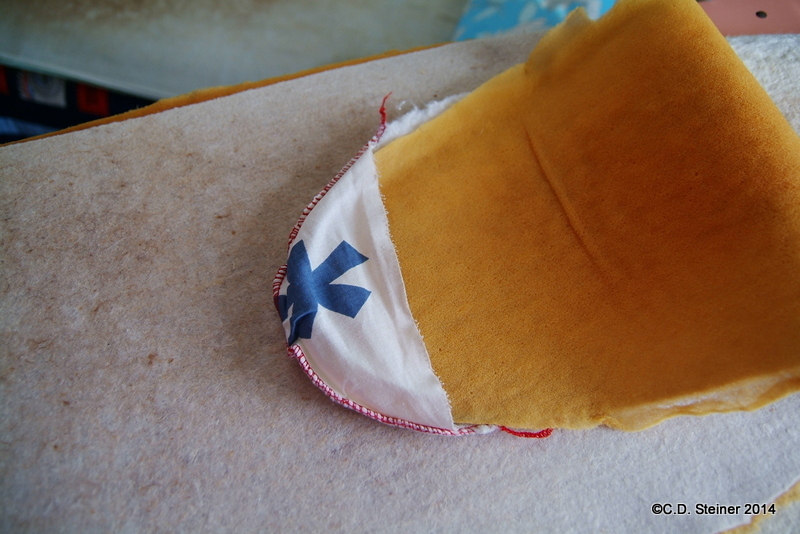 In fact, this step will take quite a bit of time but there’s no rush! 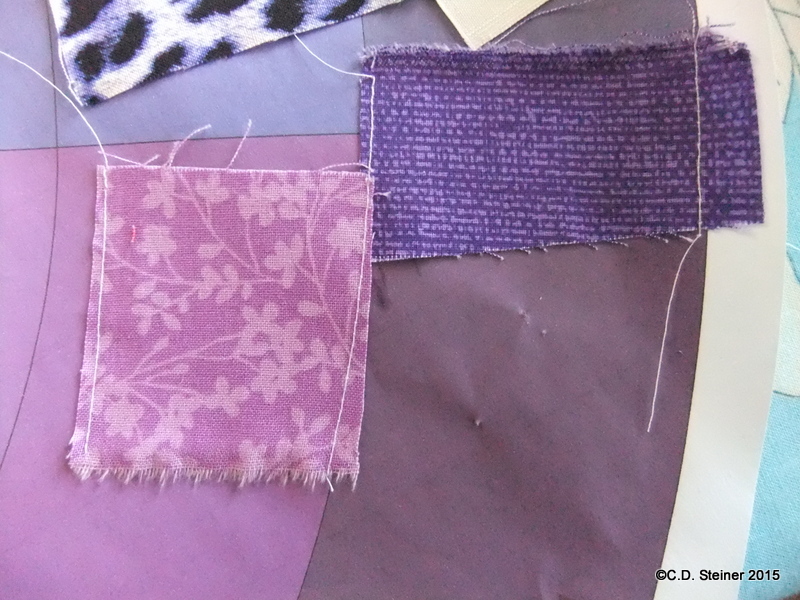 Really study the colors in your fabrics. Pin the swatches in place. As we work through our wheel I’ll address some answers and solutions for those questions. Ready to get started? Great! 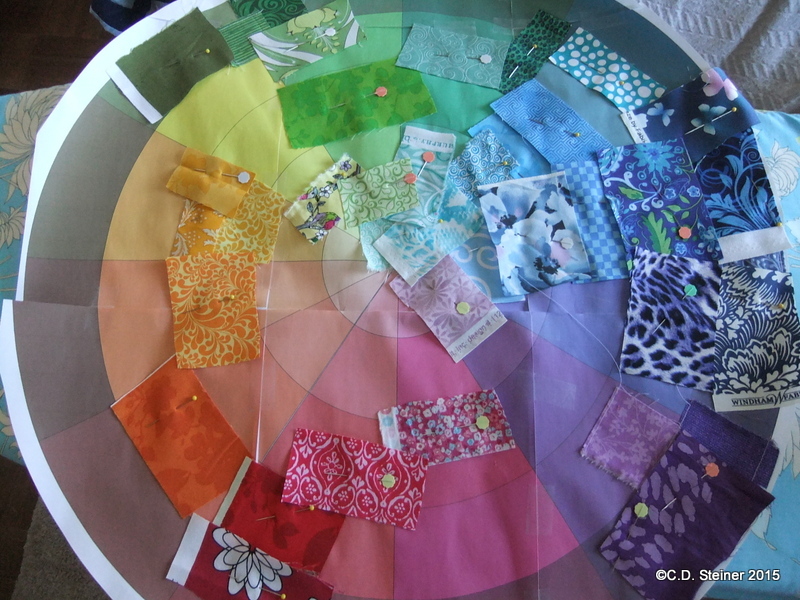 Now go and start your own Quilter’s Color Wheel! 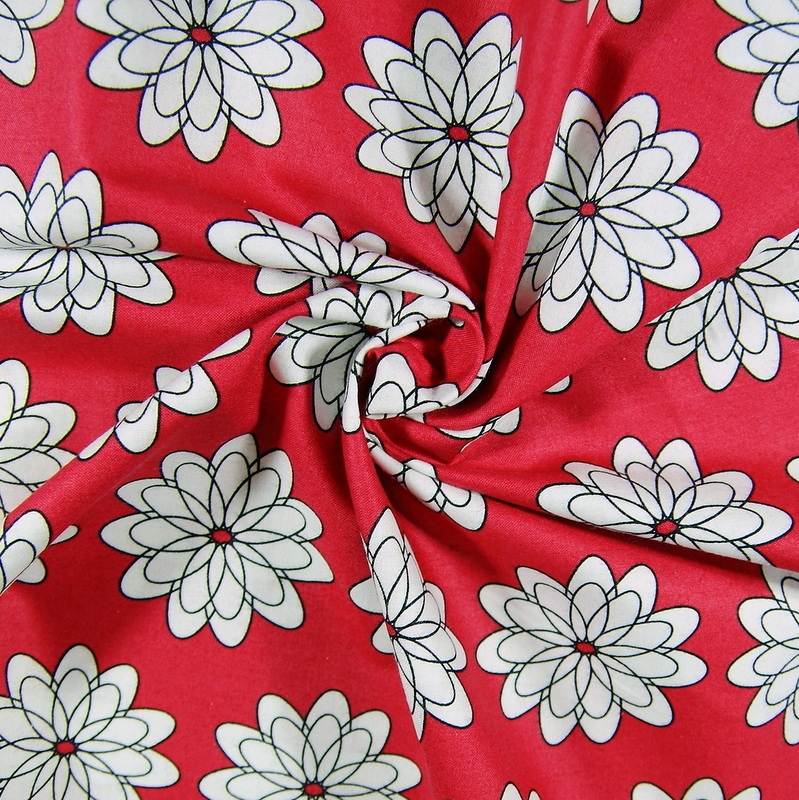 Lots of reds and some pinks have been added into the shop this week! Be sure to come in and see if any take your fancy today! 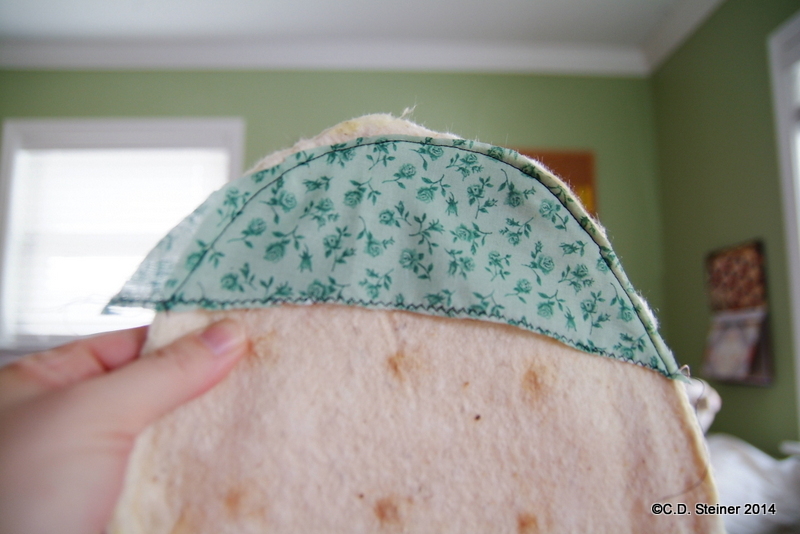 Sometimes when I’m working on sewing down my scrap pile I come across an idea. 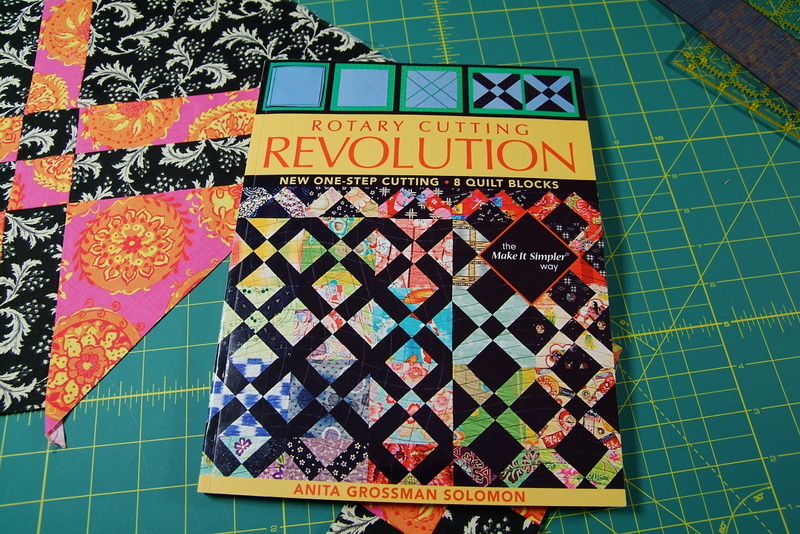 Today I wanted to see if I could make Anita Grossman’s Arrowhead block using some of my scrap strips. If you have never tried her version of the Arrowhead block I highly recommend it. 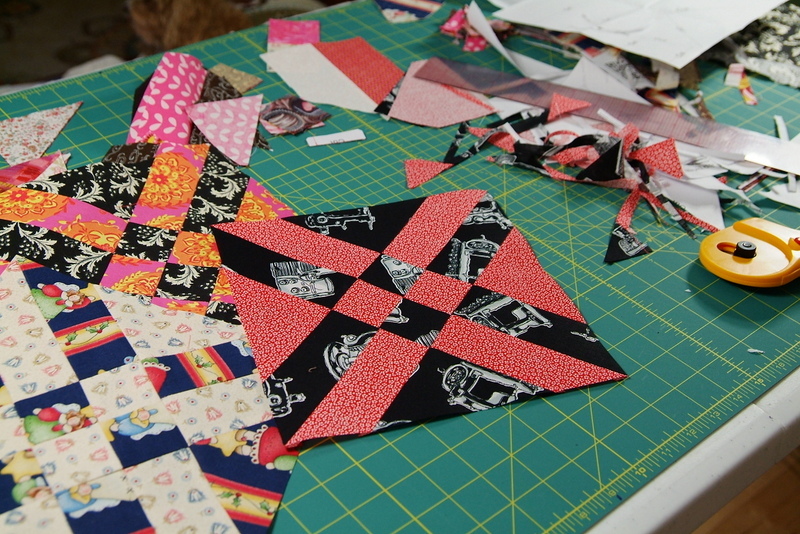 It is fun to do and will open your eyes to a whole new way of piecing. It is also featured on Anita’s blog here and here! 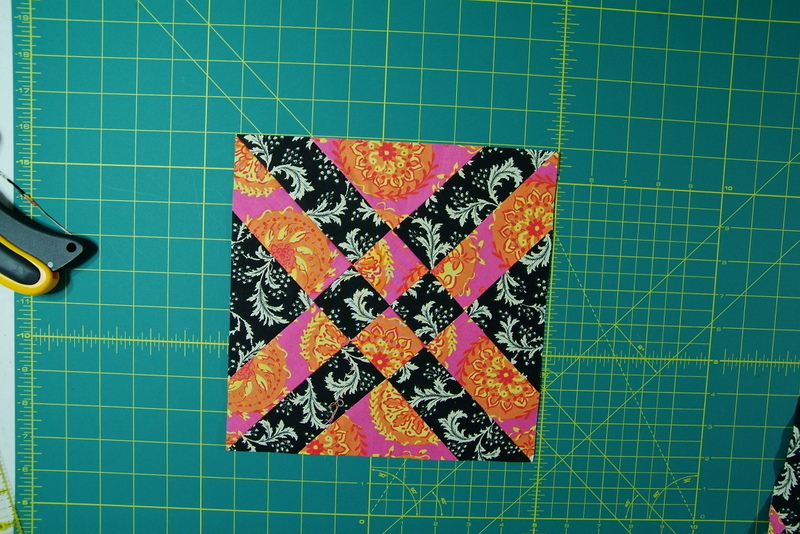 I made this block a couple of years ago at quilt retreat and the one thing I remember was the outside edges of the block are all on the bias. For some people this isn’t an issue but for me, as I’m known for OVER pressing, I know I’d run into trouble. 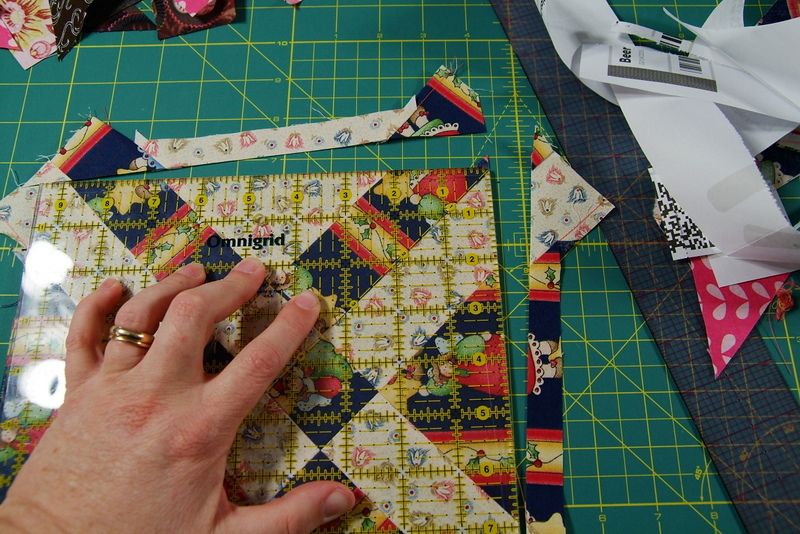 So off I am at the drawing table to re-engineer this block to get those edges on the straight of grain! 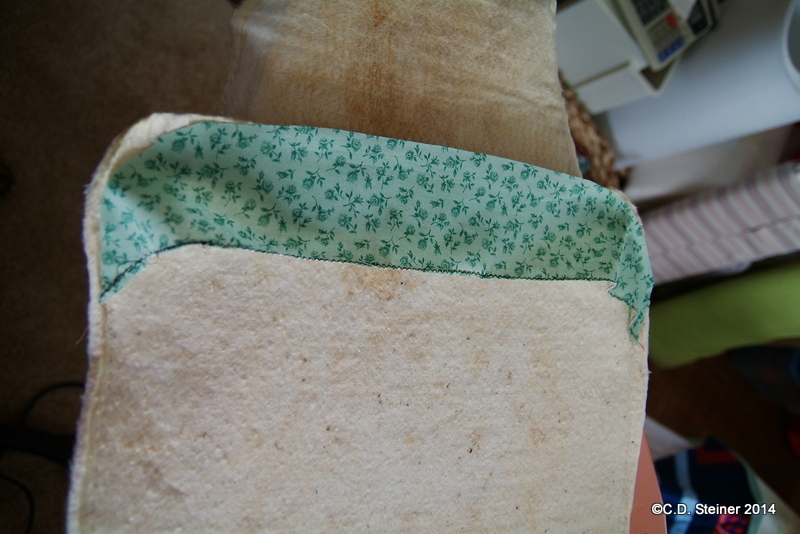 And use up some scrap strips too! 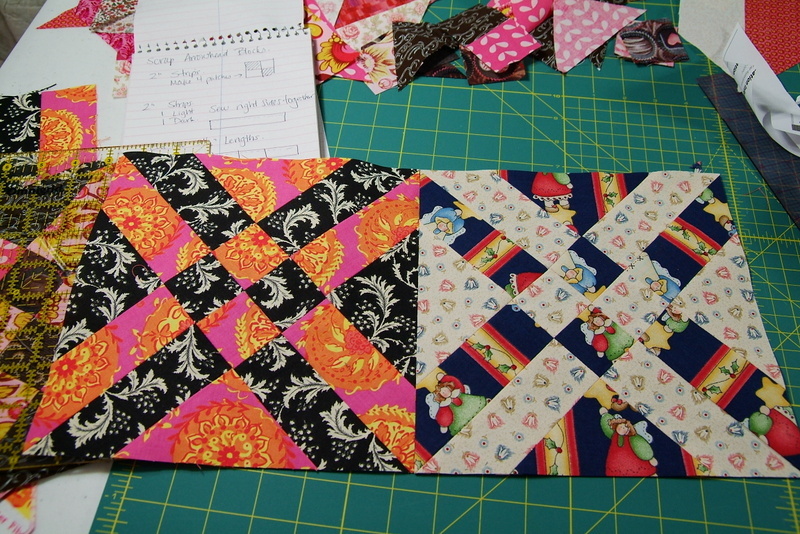 I did make one block with 2″ strips and then guessed cut some triangles. Yes, that’s a new term “Guess-Cut”! I really am triangle challenged! 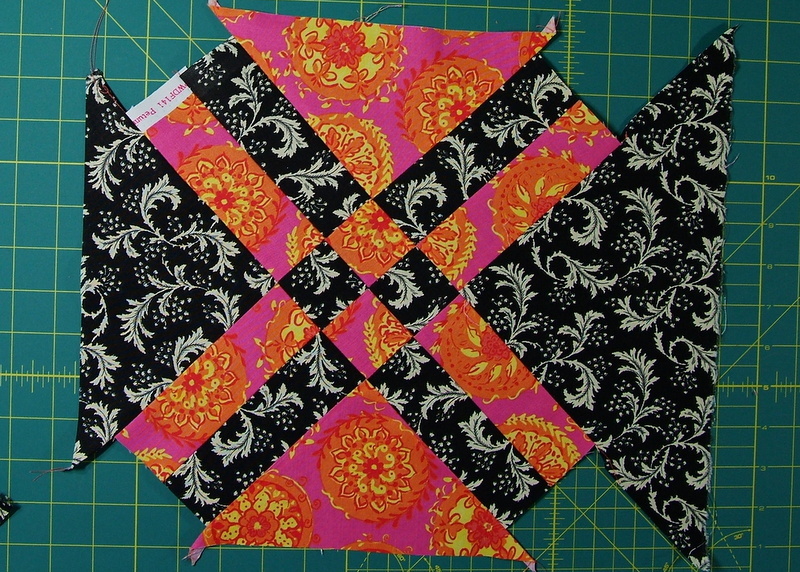 But after a trim the block came out perfect! 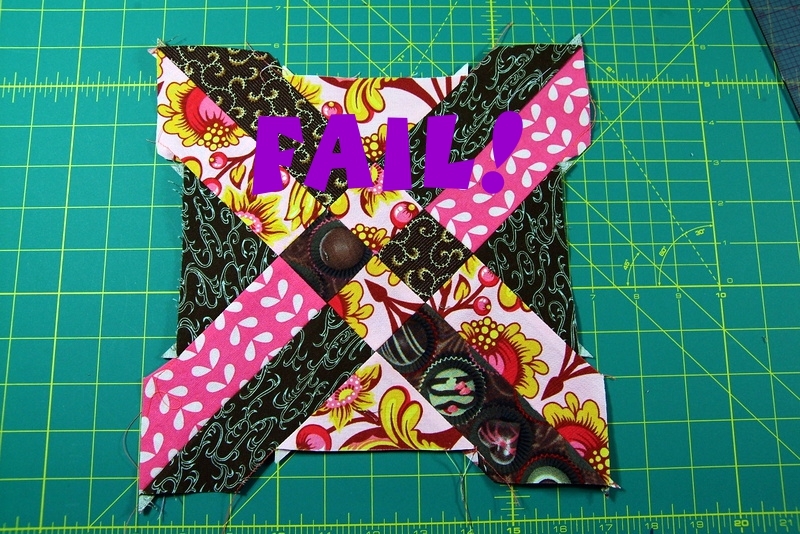 So then I tried using ONLY scrap strips and I ran into some serious issues!!! I did mention I was triangle challenged right? 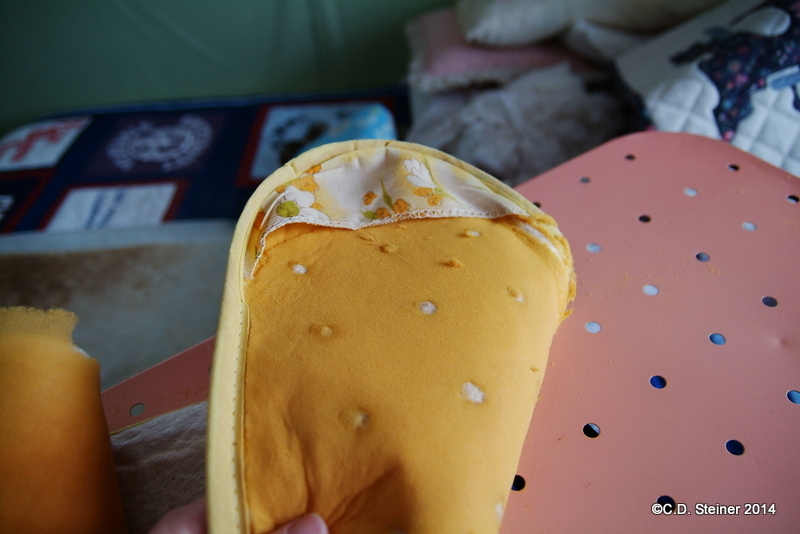 I now know what my mistake was (I should have used a 3″ strip and not a 2-1/2″) so OH WELL! Let’s do this again! 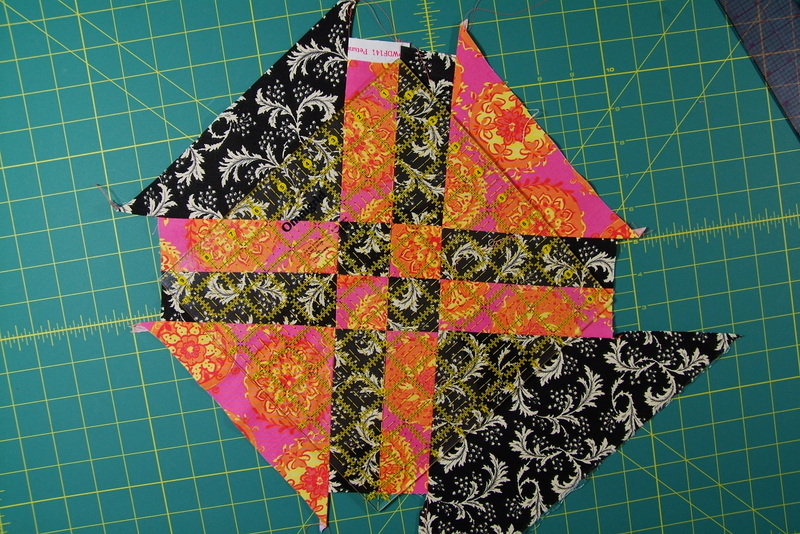 What I’m after is that long edge of the quarter square triangle be ON Grain, not on the bias. Back to the drawing board! 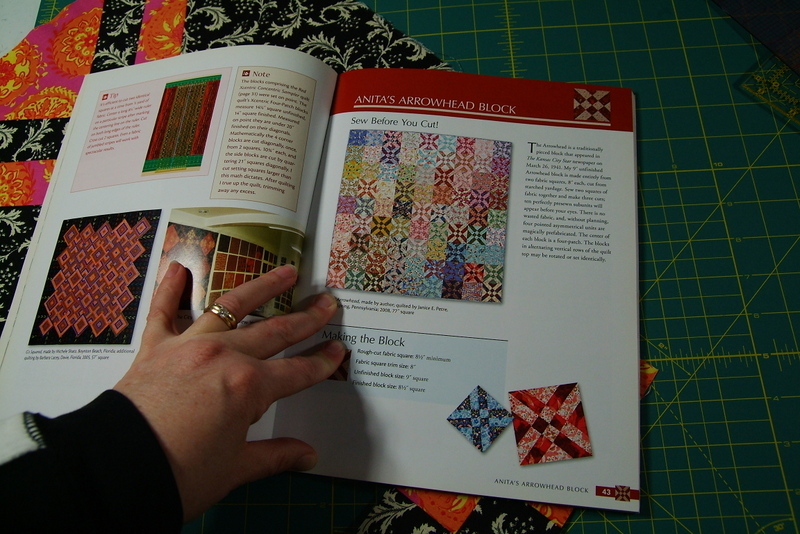 I drafted up a new pattern piece that can be used both for the paper piecing and the cutting, very similar to my Churn Dash block from last year. At last! A straight grain Arrowhead Block! Here’s the pattern in case you’d like to have a go at it! 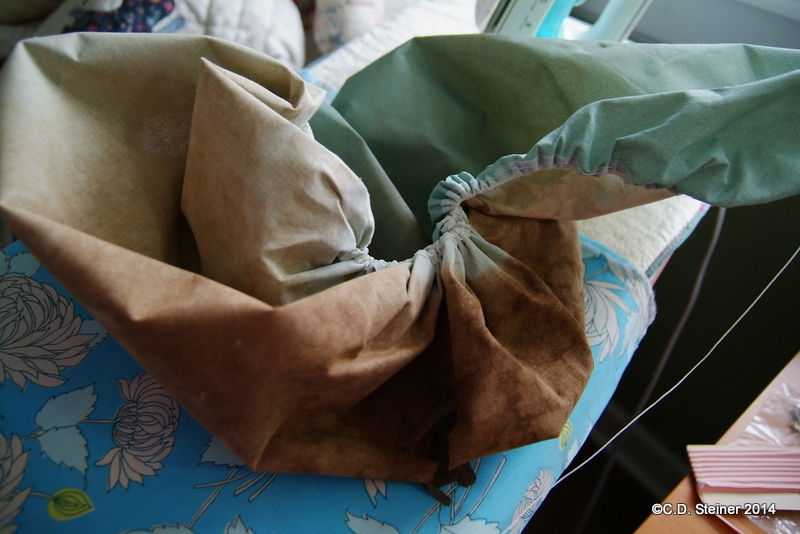 Re-Useable Grocery Bag Pattern Release! 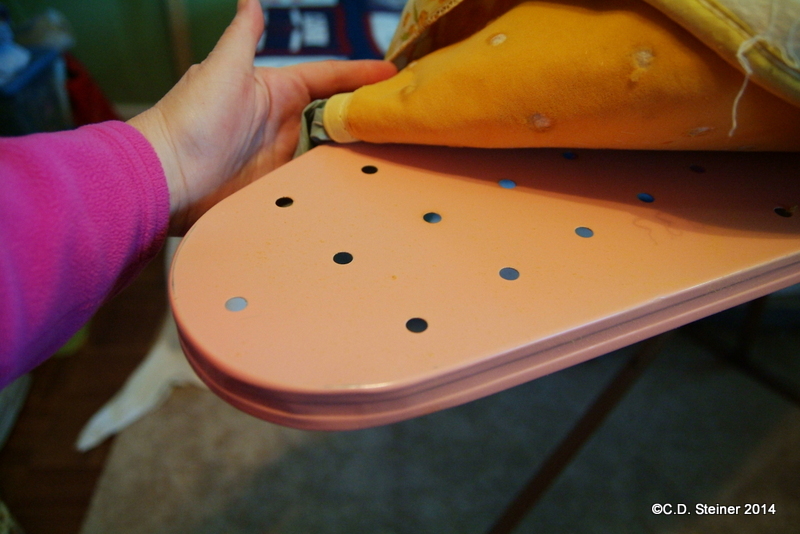 Refresh an Old Ironing Board with a New Cover! 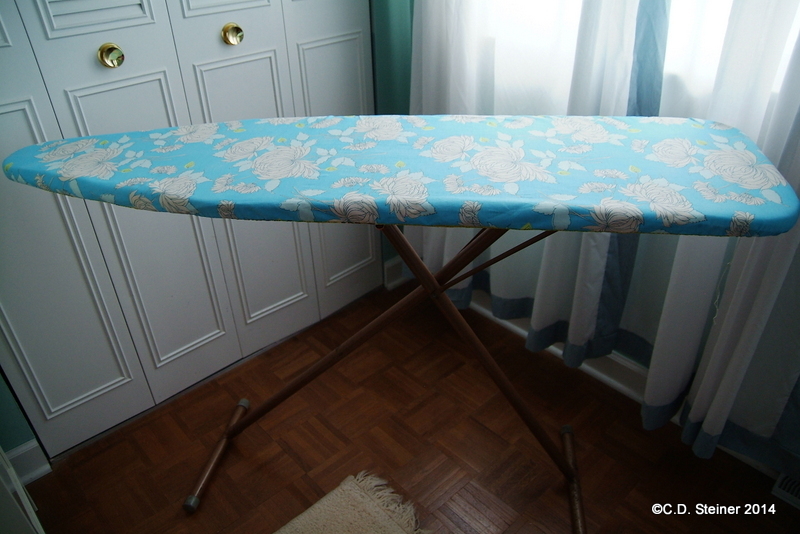 Today I finally got around to sewing a new cover for my ironing board. 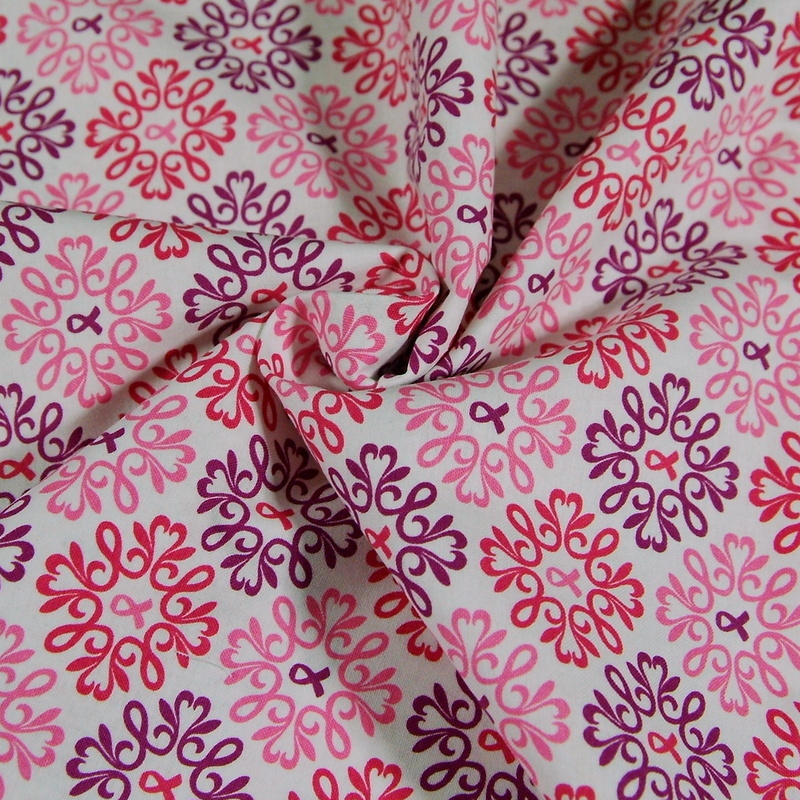 We’ve been getting so many cute, cute fabrics into the shop that I had to use one of these (or two!) to make this new cover! 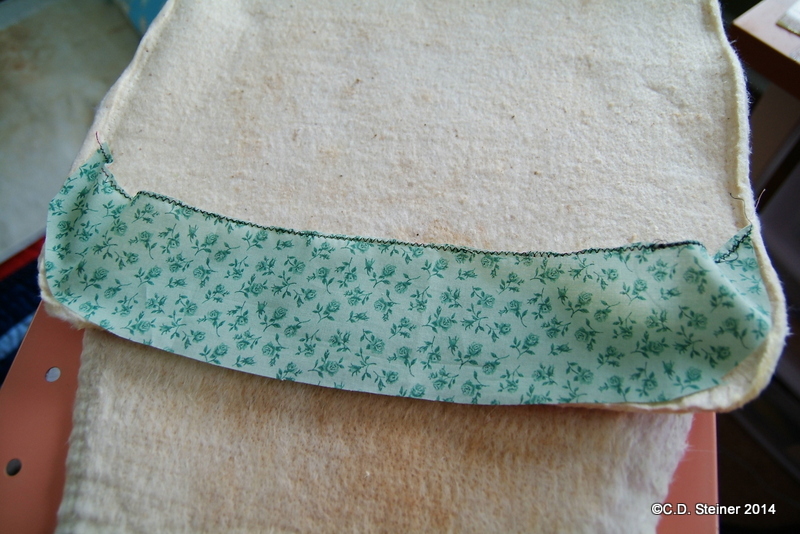 First off, let’s take a look at the fabrics I chose! That’s always the most fun right? 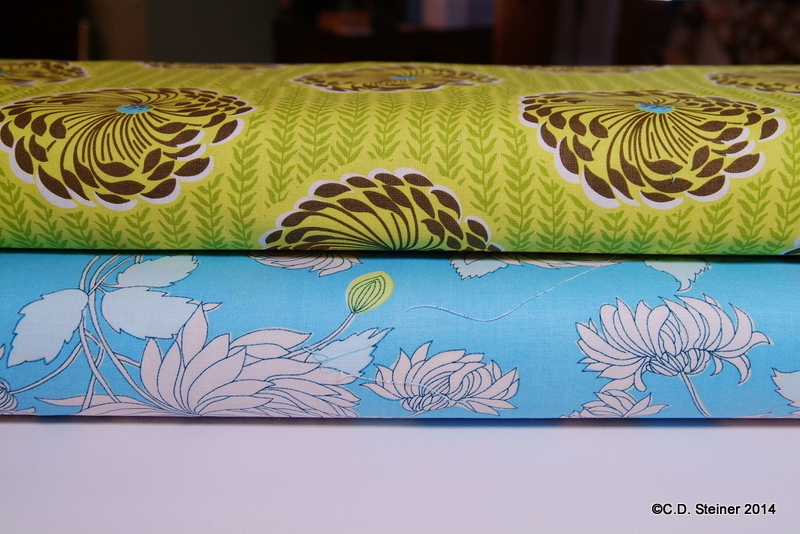 These two fabrics are both Amy Butler. The blue is called Chyrsanthemum and the green is called Delhi Blossoms! 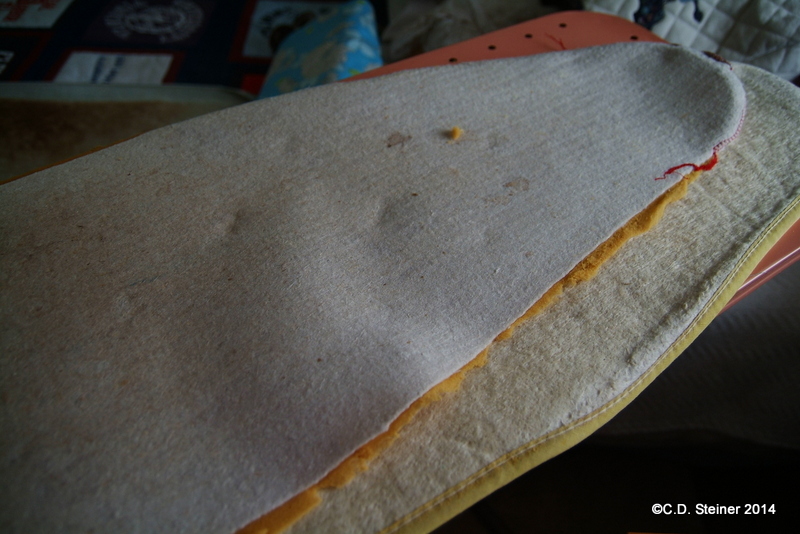 Uggh…now let’s take a look at the really horrible condition of my current cover! Yikes! This thing has seen A LOT of use over the years! 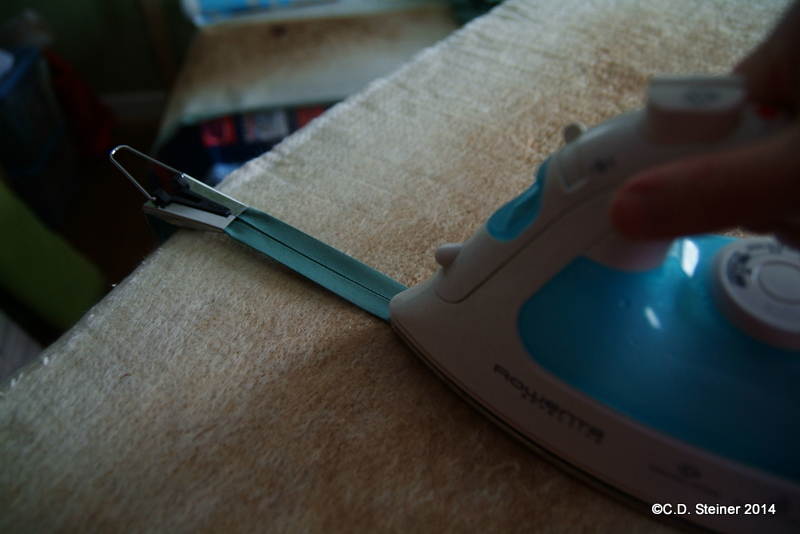 …before I finally get down to the actual frame of the ironing board. But both you and I know that foam deteriorates over time and holy cow! Look at all this foam debris! Uggh! 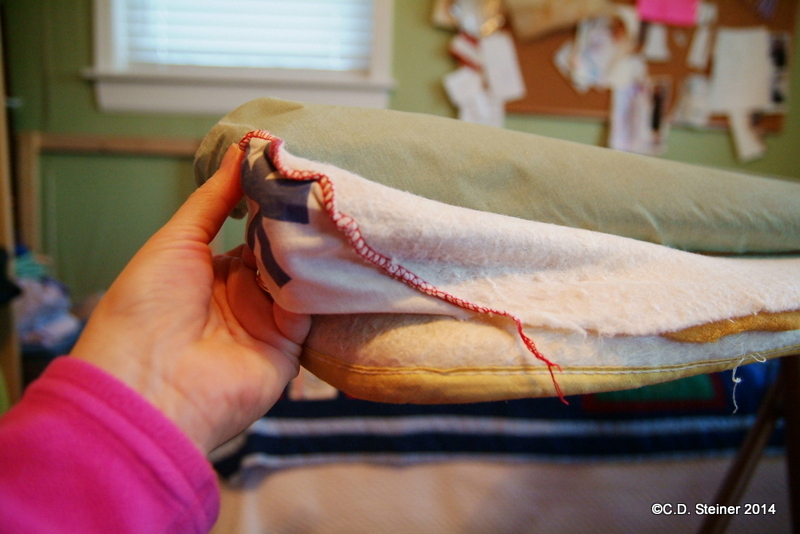 I decided to toss one of the pads and the other one would get the full restoration treatment. 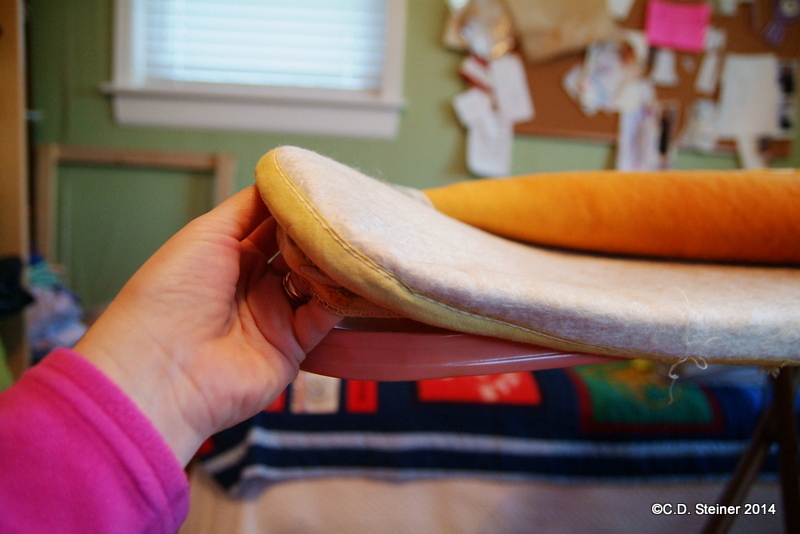 I wasn’t up for making a new pad and this one had three layers, a fiberglass, a cotton batt and a foam layer. 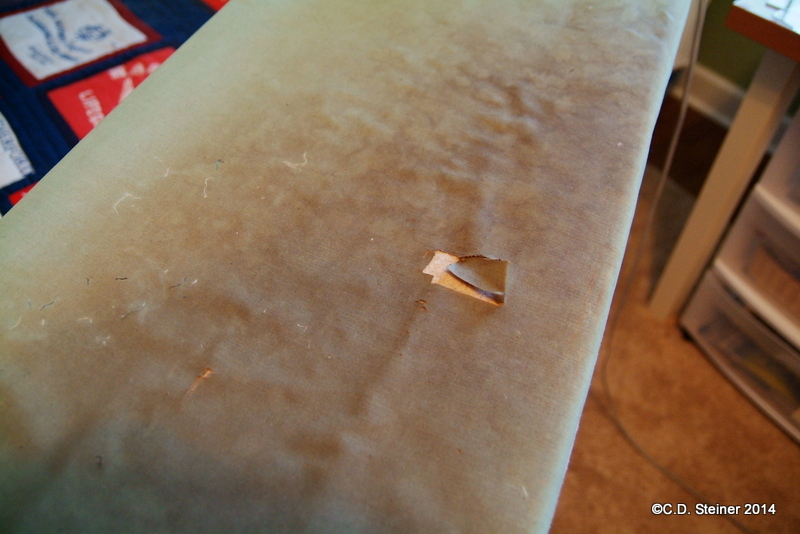 There was probably no way I was going to find that fiberglass layer so this one is getting restored! Now. I know what you are thinking. 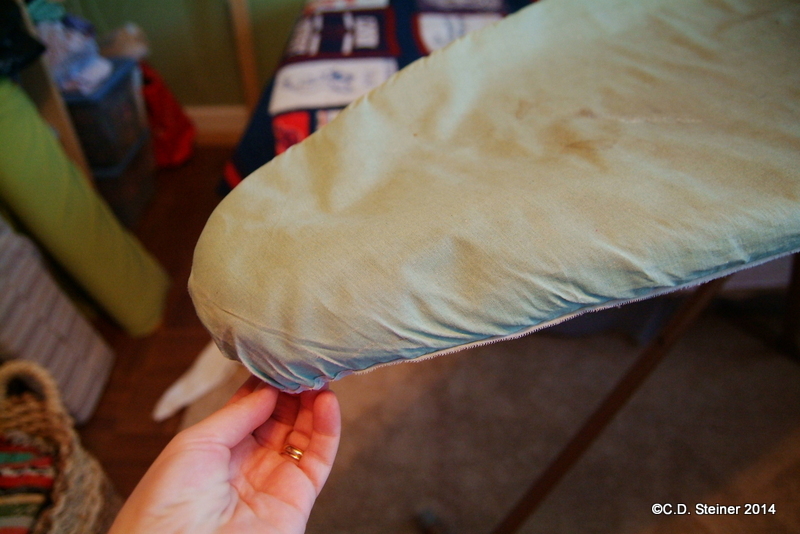 Why would I even Want to restore an old, tired, ugly ironing board foam pad and make a new cover for it? Right? Isn’t that what you were thinking? I can hear it right now. Just go to the store and buy a new one, right? Ah. Well. I’ve done that. Going to the store and looking for a new cover I mean. I found one at Walmart and one at Target but both were made from fairly cheep and crappy, not to mention seriously ugly, material, cost $18-$20 and I’d still have to find the padding. For that much why not get what you want and make it yourself? So that’s my story, my reasoning and I’m sticking to it. And you know what? Now that I’ve made one and have a pattern I can make many more in the future! Okay…so let’s get back to the restoration. The sleeves. I kept these to make a pattern. Oh look! This was from SEARS! Where “America Shops for Value”! 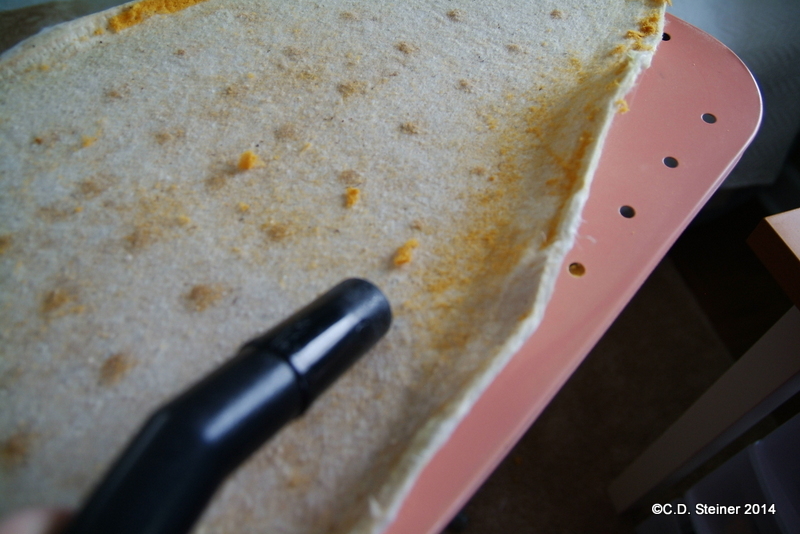 Carefully, I vacuumed all the remaining foam crumbs. Next. 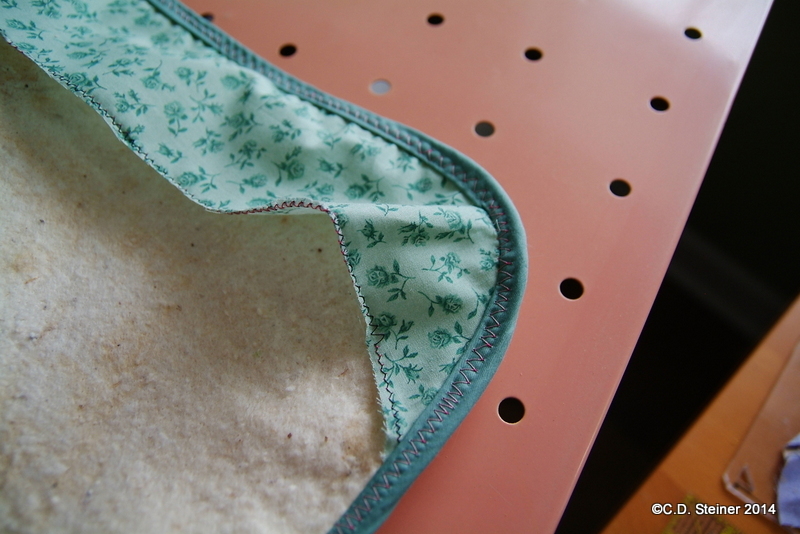 I ironed those sleeve pieces and created new ones using some scrap fabric. 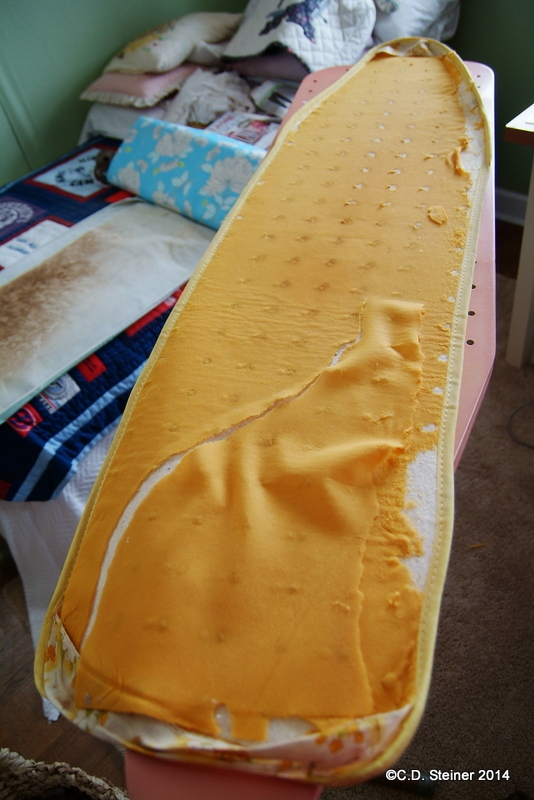 Pressed it up real good! Ha! And attached it to the old pad. Nice huh? 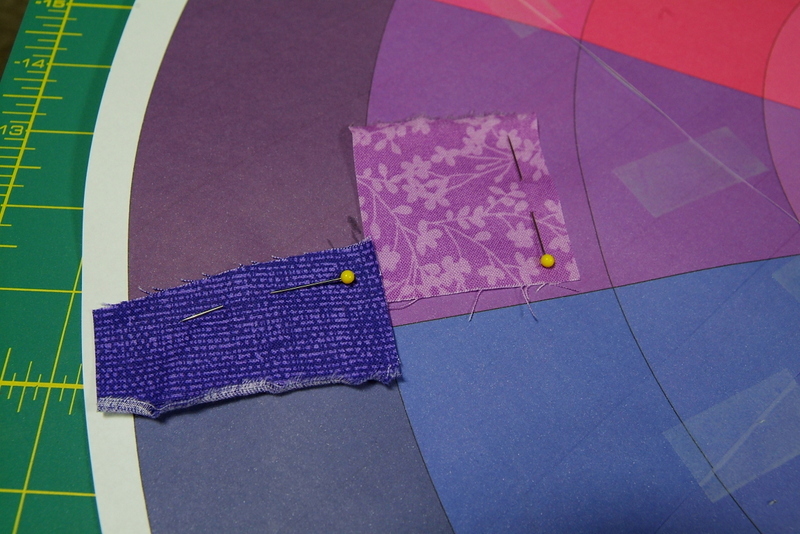 Then I made a pattern from the original cover and cut out my chosen fabric! 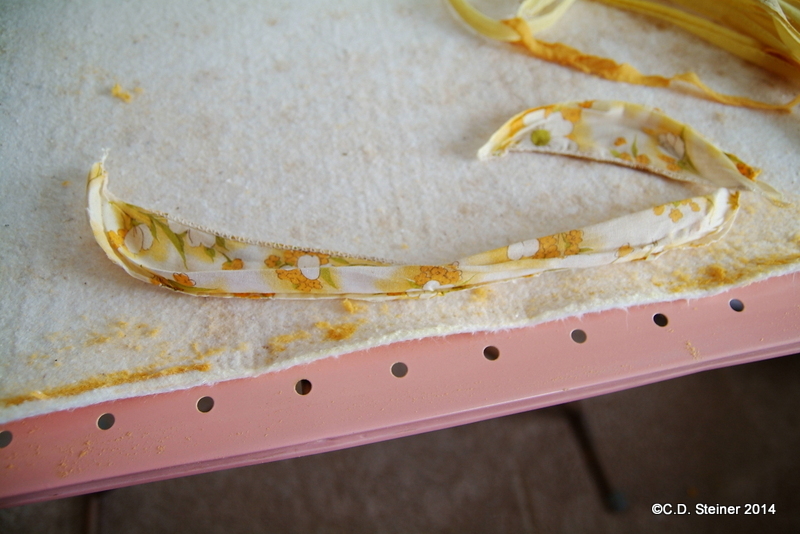 I used the Chrysanthemum for the cover and Delhi Blooms for the binding. 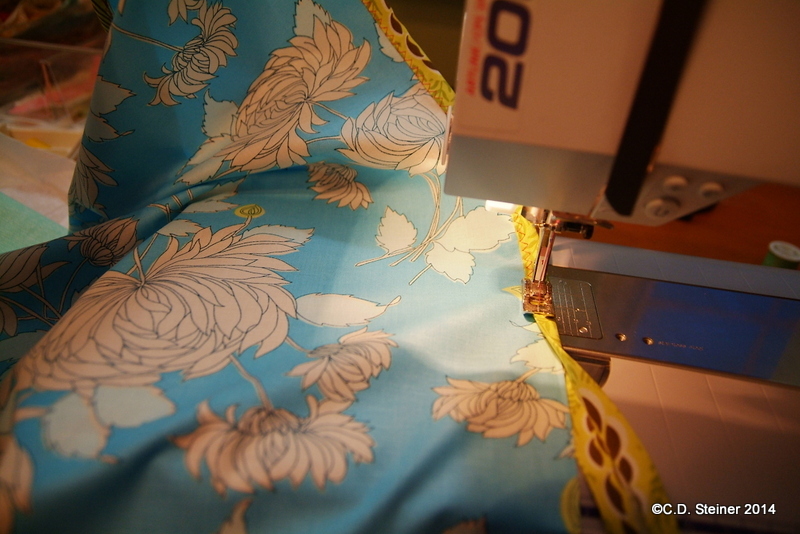 The bias binding is a 2 inch wide bias cut piece of fabric, pieced where needed and run through my bias maker. 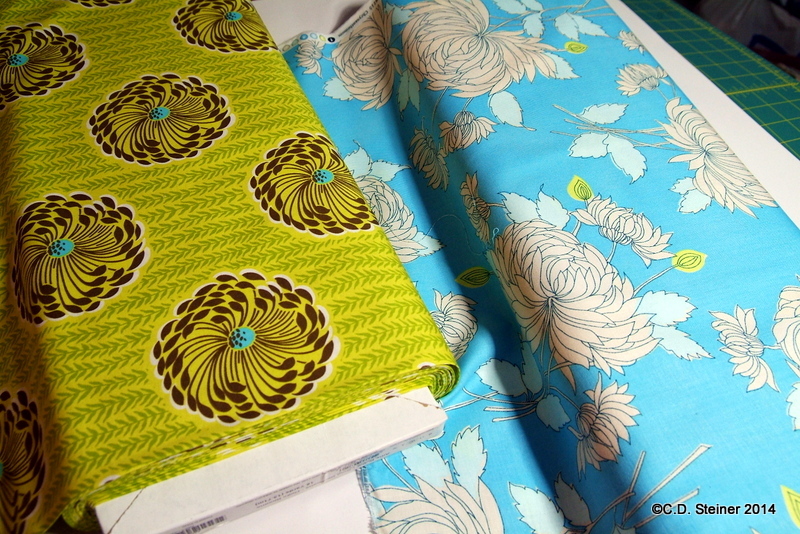 Both fabrics are currently in the Shop! 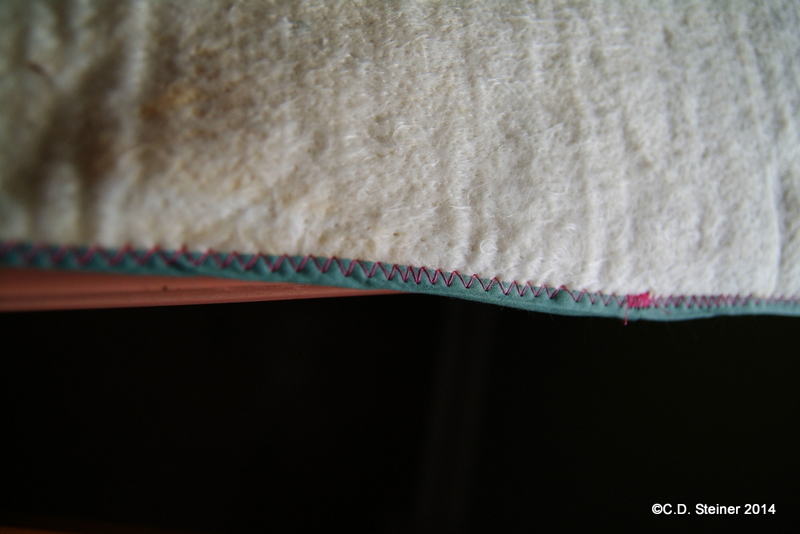 At the beginning and ending I folded the edges under and just butted these edges together. I need to have a place to insert the cord. 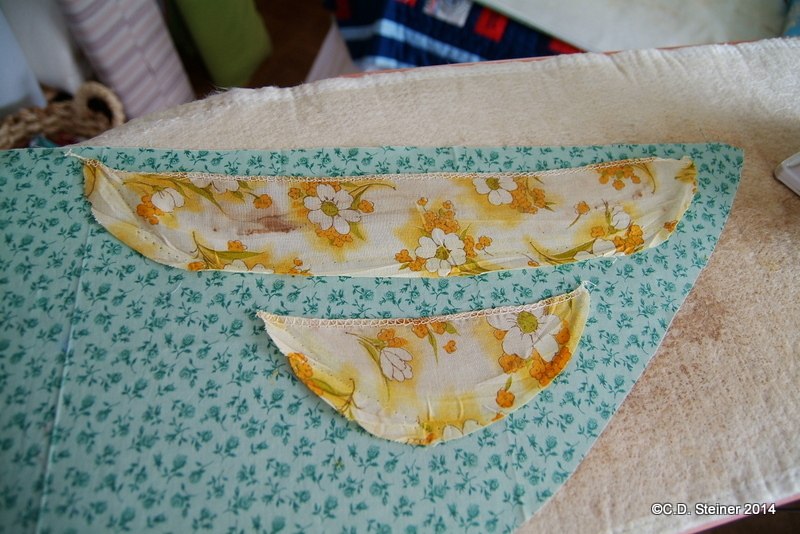 This is a great alternative to button holes and yet leaves a clean finish! 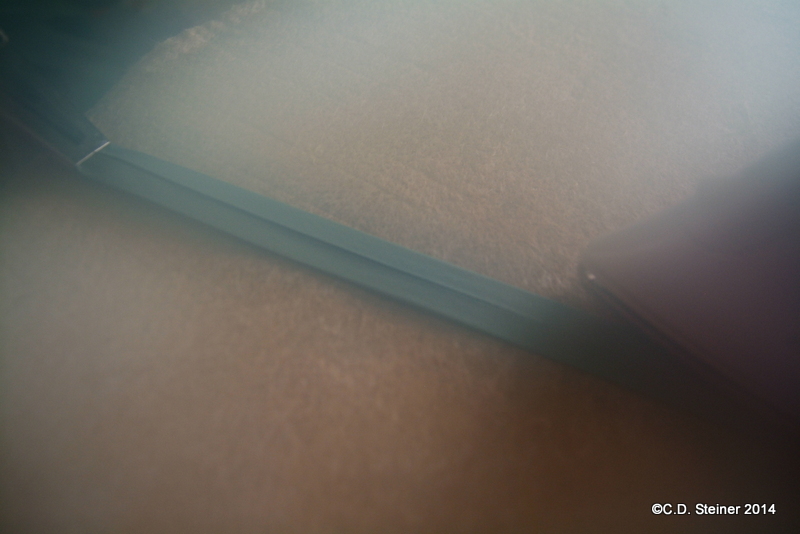 The cord gets re-inserted. 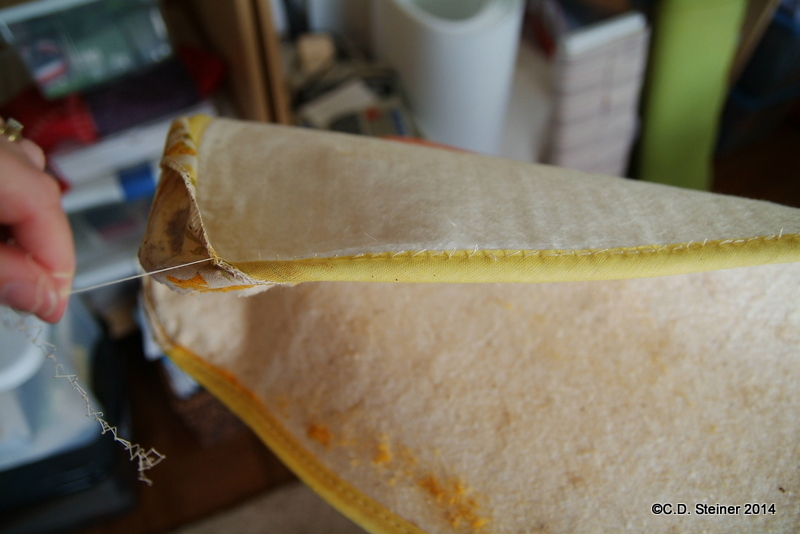 I used a safety-pin but a bodkin would work too. 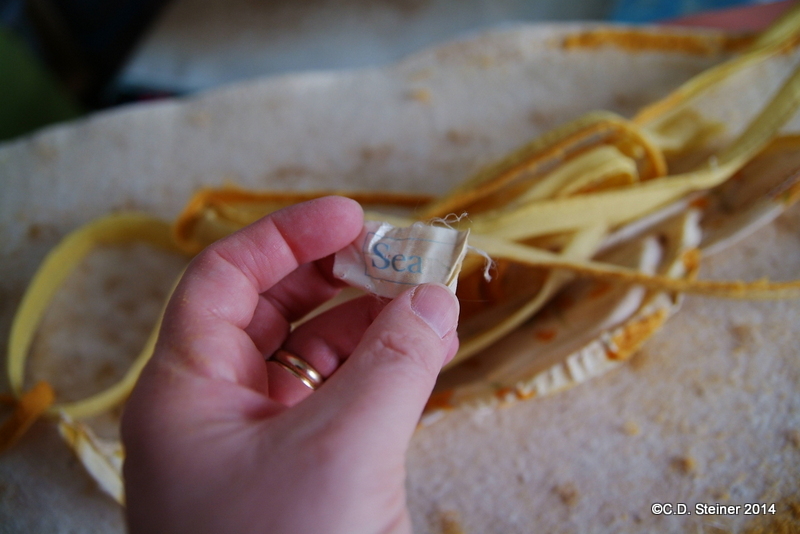 Then I re-used the cord-lock from my old cover to keep everything taught! 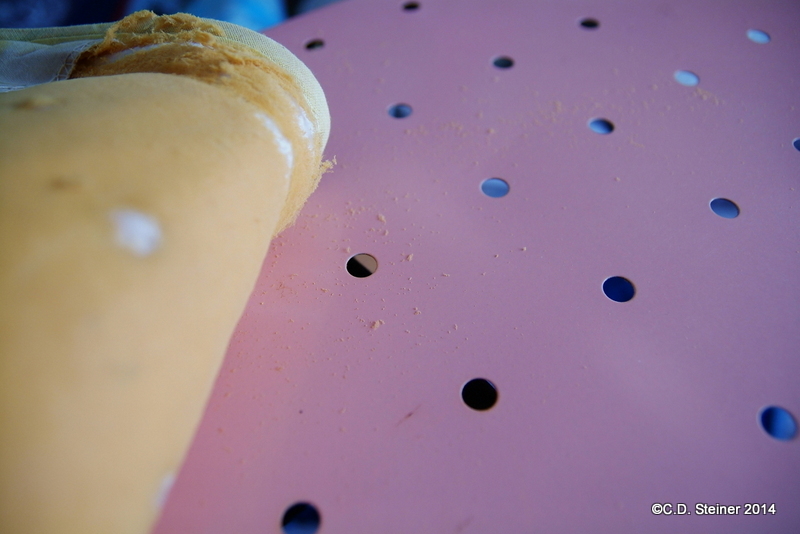 A photo of the underside…someday when the weather turns warmer I’d like to paint this board a wonderful Chartreuse! 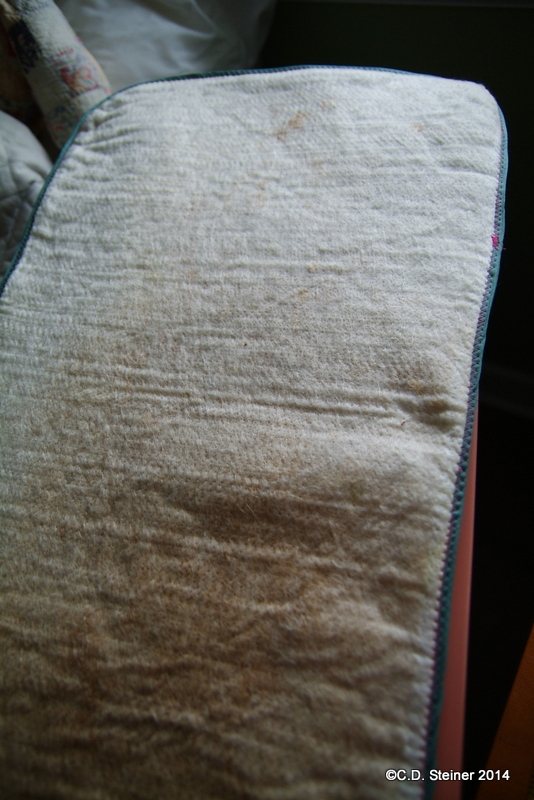 And here are the after photos! Ahh! Much better don’t you think?